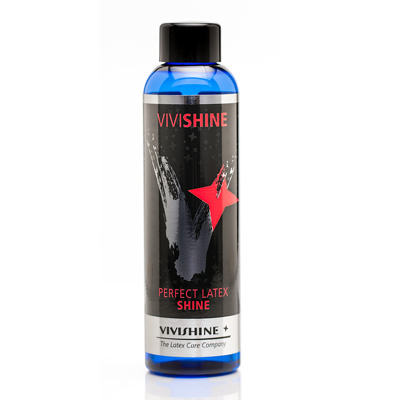 VIVISHINE replaces typical latex care products such as silicon spray, creme or polishing stuff. Its very easy to use and efficient. VIVISHINE provides a longlasting gloss to latex outfits an keeps them gracefully as on the first day. Please wash the latex after carrying thoroughly. For that are suited e.g. dish or antiseptic soaps. Thus one avoids that bacteria, sweat or similar get stuck in the material.The best thing ist to take off best of all the latex immediately under the shower and wash it with yourself. After washing, engage a few liters of clear water into the tub and add some Vivishine. Now briefly the latex in it bathe and move something, so that all places are evenly moistened. Tips for dosing can be found on the next page. Shake off the water from the latex and hang to dry and air a few hours. Especially in hard water is recommended to dab the drops of water with a towel. A perfect shine is ready.